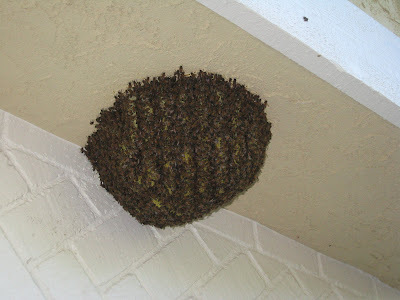 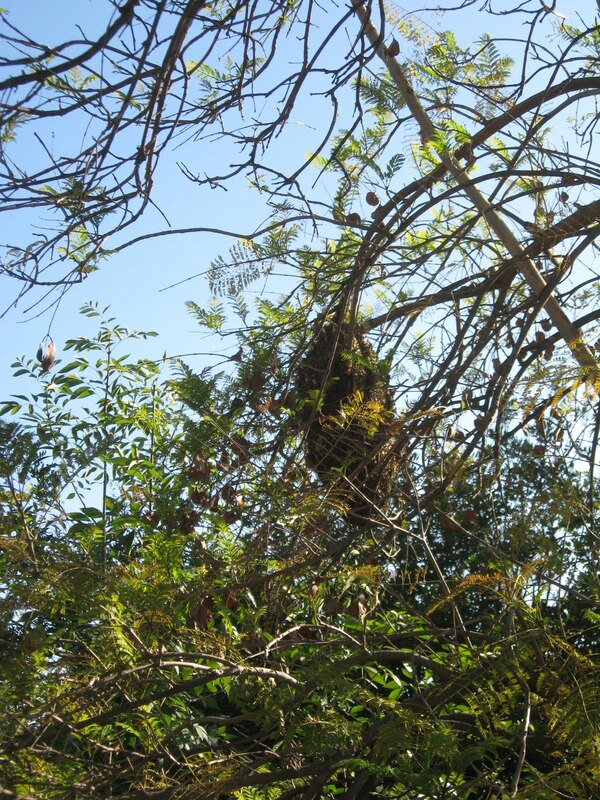 I got a call a couple weeks ago from a very nice lady named Kim, who said a newly formed hive over her garage was becoming quite the tourist attraction in her neighborhood. She felt the hive needed to be removed, but was quite adamant about keeping the bees alive in the process. I assured her I could and would. 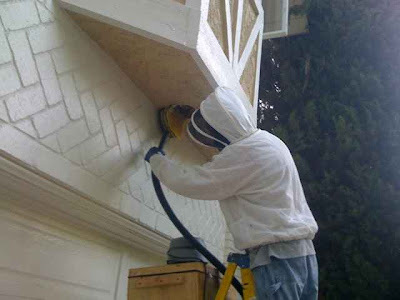 I've started to shy away from cutouts, as I'm finding only about a 50% success rate in terms of the bees staying in their relocated home, but Kim's hive was very accessible and I was so impressed with her concern for the bees, I decided to do this one. 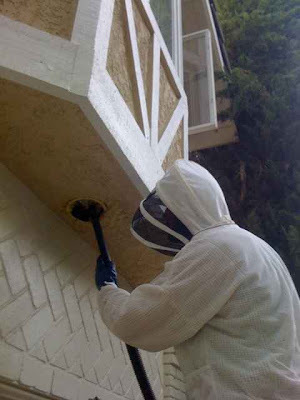 As I removed a majority of bees from each comb, I'd slice them from the stucco using my hive tool. 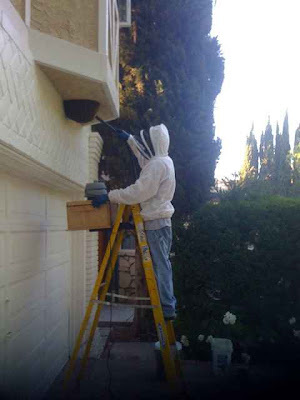 Then I vacuumed off any leftover bees on each comb, and put the comb into a covered bucket. The activity drew quite a crowd in the neighborhood, so I took the opportunity to give a little bee education to the kids, and let them taste some honey fresh from the comb. 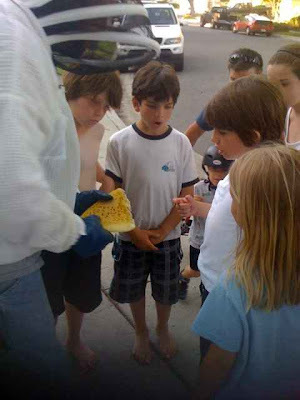 Note the amount of capped brood on the comb; I was actually able to show the kids all stages of larva and even some emerging bees. 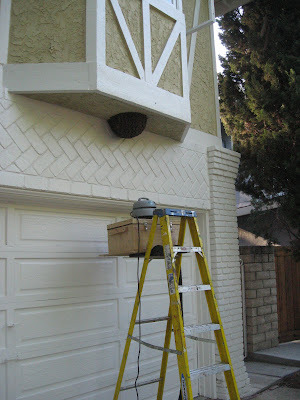 Once I got all the comb cut away, I had to chase after the holdouts inside the light fixture that was hidden under the hive. 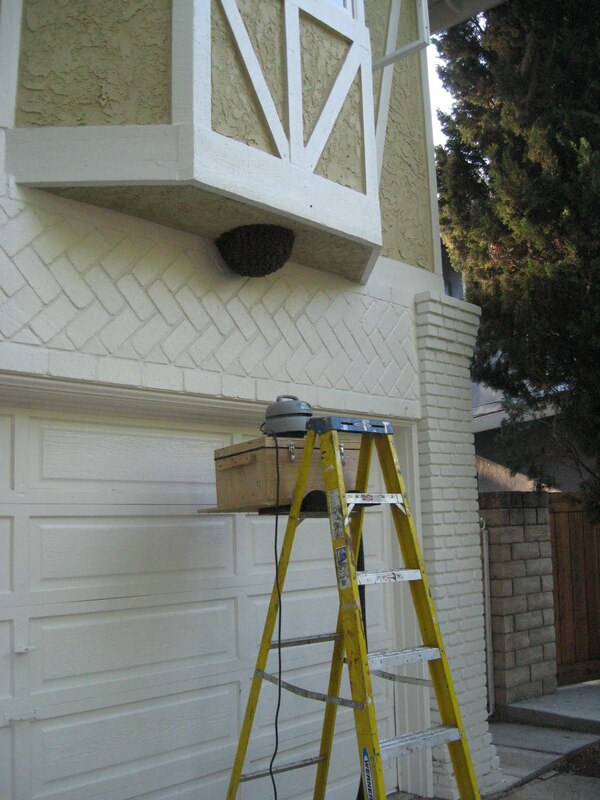 I didn't want to miss the queen, and I was worried she might have skedaddled up into a hiding place in the fixture. 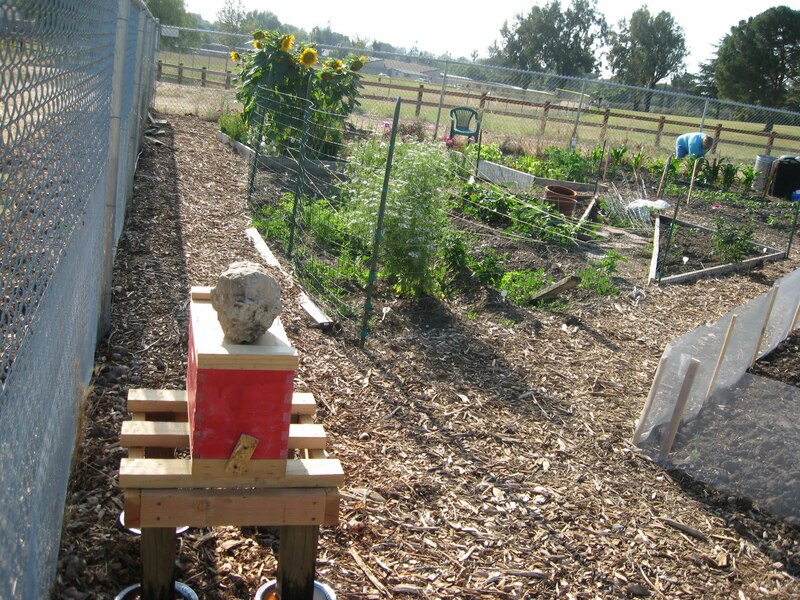 Notice the tin pie pans under each leg of the hive stand? 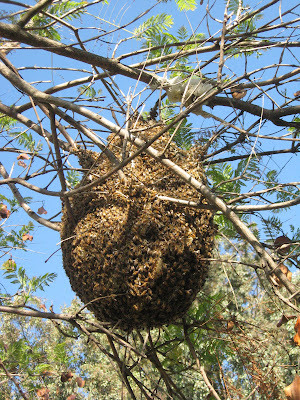 I had to put those there because the very first night this poor hive was inundated with ants. So, I put oil (it's an organic garden, so I used corn oil, although at home I often use old motor oil) into the pans, and the ants can't access the hive. 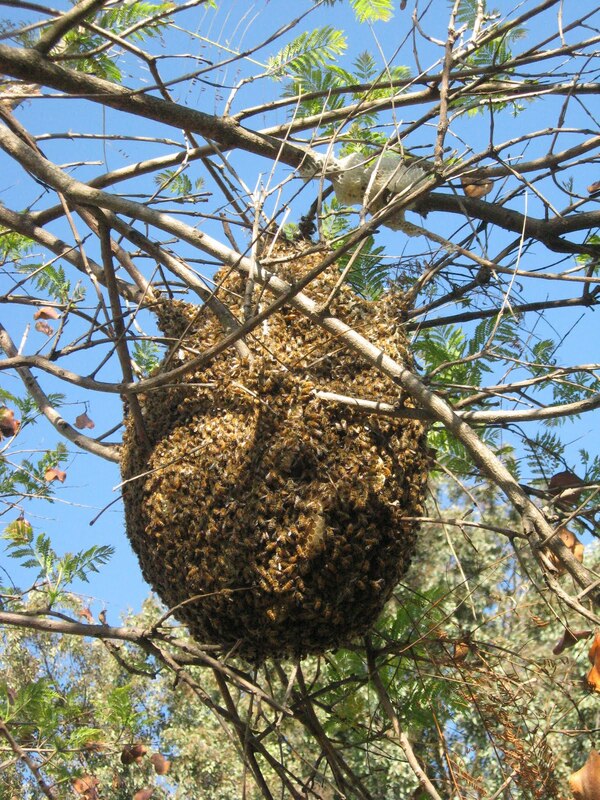 All's well; it appears I definitely got the queen, because they're doing fine, bringing in pollen and doing all the regular bee stuff.